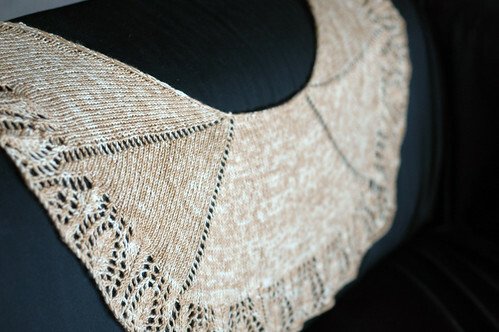 dull roar: Wheatberries Shawlette, hooray! I've been experimenting with putting increases in various locations to see what shape comes out. This one is a neat, squared-off kind of crescent shape that really lend itself to being worn a bit like a capelet. 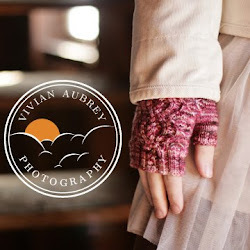 The vast majority of the project is easy knitting, with just one repeat of lace stuck in at the bottom to give it a little pizazz. 2. Bind off loosely!! Maybe block it first, and then bind off. My bind off is a bit too tight, even though I went up to size 10 needles, haha. 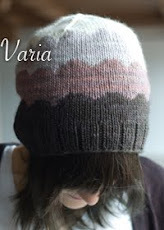 This yarn is delicious and I am loving the finished project and the unusual shaping. Several testers knit it up on larger yarn- sport or dk- and it came out beautifully there as well, so feel free to play around! On a personal note, I've decided, after being painfully reminded of just how expensive veterinary care is, and finding out how insane and largely useless pet insurance seems to be, that this shawl will be my pet insurances for our next rescue pup (we're holding off until after the move, but golly, how I miss having a dog around.) All the proceeds will be put in a special savings account just for poochy medical needs. Hopefully by the time he's old and needs it, there'll be a nice little nest egg. I don't want to ever have to consider the price when deciding on an animal's care- it's the worst feeling in the world. 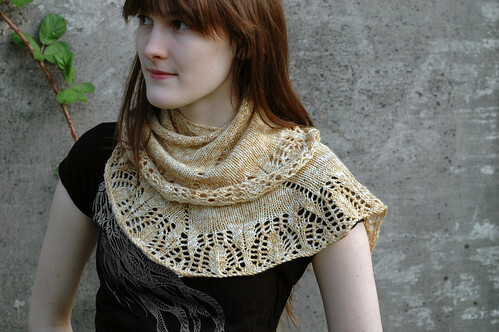 Love the shape, this is a very nice shawlette! 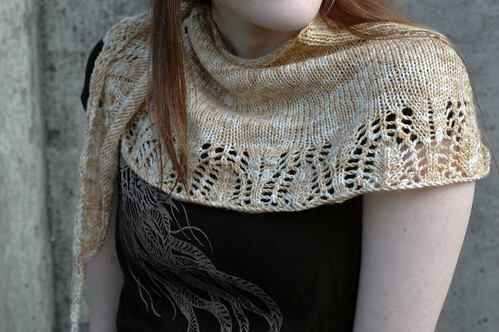 I have just purchased Dull Roar and the Wheatberry patterns. I am a Novice at knitting Lace. Can you tell me what the measurements of the Finished Shawlettes? It will depend on your gauge (since it's a shawl, it's not a big deal if you don't match it exactly ;-) ) I'm not sure exactly what mine was as it hasn't been blocked in years, but I'd say about one foot "deep" at the widest part, and five feet from tip to tip if you stretched out the "U" shape.